Four Coin Black Cardboard Gift Box - 5 3/4" x 5 3/4" x 5/8"
Home > Coin Gift Boxes > Air-Tite Plain Cardboard Coin Gift Boxes > Four Coin Black Cardboard Gift Box - 5 3/4" x 5 3/4" x 5/8"
Plain black embossed paper wrapped cardboard gift box with lift off cover. The coin or medal is secured in the archival safe Air-Tite coin capsules and then pressued fit into the display card of your color choice: Black, Blue or Burgundy. The display card can be flipped to allow for viewing the items reverse. 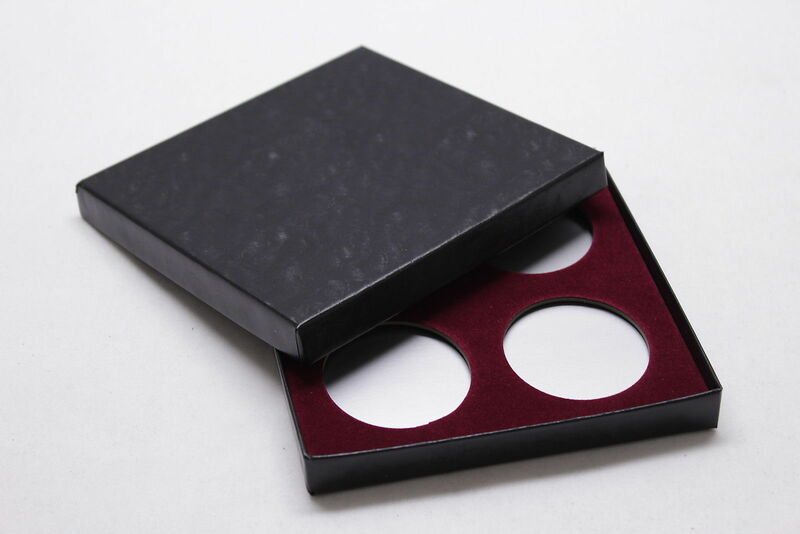 Box measures: 5-3/4" x 5-3/4" x 5/8"
Five Coin Black Cardboard Gift Box - 5 3/4" x 8 1/4" x 5/8"